The presentation Reverse Engineering Vaccines is an interesting presentation by Nienke van Houten on how viruses mutate inside a mammals body. In the presentation Nienke refers to HIV/AIDS, but the theory of virus multiplication se explains is the same for H7N9. For a better understanding, se the presentation Reverse Engineering Vaccines. Avian flu epidemic 2003 in Holland: public health consequences. Avian flu epidemic 2003: public health consequences. Risk factors, health, well-being, health care needs and preventive measures during the H7N7 avian flu outbreak control in the Netherlands. 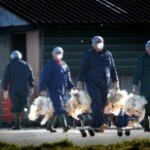 An estimated thousand people, possibly more have been infected with avian flu during the outbreak in the Netherlands in 2003. One third of the poultry farmers whose holdings were cleared reported stress reactions, fatigue and depressive symptoms. The large spread of the virus underscores the importance of the measures to prevent poultry- to-human transmission in people handling infected poultry. The possible uncertainty, stress and anxiety associated with the avian flu control demand specific health care attention. A total of 453 people reported with health complaints, predominantly conjunctivitis. 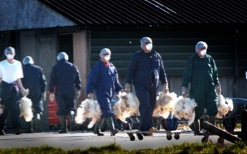 Antibodies were found in 59% of infected poultry workers’ family members. Of the 500 tested persons who had handled infected poultry, about 50% showed an antibody response. In this paper represents a short narrative history of the Foot & Mouth Disease outbreak (FMD) in the UK, 2001. Prof. David Campbell and Prof. Robert Lee seek to demonstrate that there are obvious messages arising out of a review of the history of the outbreak. In particular this paper suggests that there are structural confusions inherent in the framework of disease control and response, whereby policies adopted to serve one outcome have precisely the opposite consequence. The World Bank published this final report in 2009. The main aim of the Study is to develop global guidance for potential Bank interventions in the livestock market and slaughter sector. 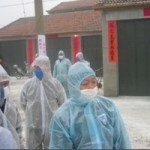 In the light of the current developments concerning H7N9, traditional slaughter methods will be an absolute No-Go option. So soon the main question will be: How to slaughter animals in the field without direct contact between animals and humans and without creating bloodshed during killing? The World Bank published this final report in 2009. The main aim of the Study is to develop global guidance for potential Bank interventions in the livestock market and slaughter sector. Due to population growth, urbanization, and increased per capita demand for meat products, livestock and poultry production is projected to grow four times faster in developing countries than in high-income countries, with growth in pork and poultry more than twice the growth in the production of ruminate meat. It is estimated that 800 million people worldwide still suffer chronic under-nutrition and hunger; thus, the growth in livestock and poultry production is expected to continue to escalate with a resulting increase in the quantity of livestock wastes generated. 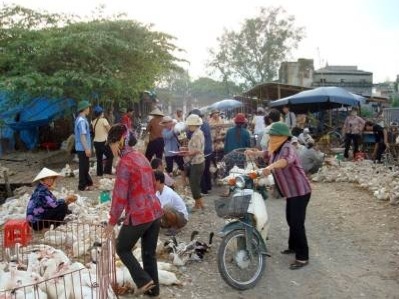 GENEVA/BEIJING-The World Health Organization said on Wednesday that a number of people who have tested positive for a new strain of bird flu in China have had no history of contact with poultry, adding to the mystery about the virus that has killed 16 people to date. China is opening up and learnt from the past it seams. They started to share information, but only in relation to the human cases. Not a word about the source of the outbreaks. Not a word over where the infected farms are. 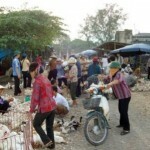 Pigeons are very unlikely to spread the virus through markets. If you have to run the biggest town of China, providing the people with eggs and poultry meat, you need extremely large farms, close to the customers. Well-protected, because of the risks that the animals are going to be infected. Think what the financial consequences would be if these farms should have to e closed. One of the things that is important when it comes to human infections is the Case Fatality Ratio CFR of the virus, commonly called a case fatality rate, although it isn’t technically a rate but a proportion. 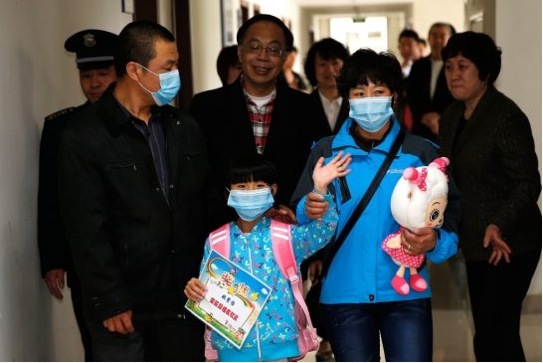 On 10 April 2013, 33 human cases of infection with influenza A(H7N9) virus have been reported in four provinces of China: Shanghai (15), Jiangsu (10), Zhejiang (6) and Anhui (2). 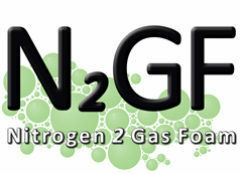 since 31 March 2013, with onset of disease between 19 February and 3 April 2013. The date of disease onset is currently unknown for five patients. Nine patients died. That means that the current CFR = 27%, but there are still 21 are severe cases and three are mild cases. The median age is 64 years with a range between 4 and 87 years; 11 of them are females. To calculate CFR, you can only count resolved cases, that is, people who have recovered or died. We don’t know for sure how many are still in hospital, but it appears to be a large number, many in critcal condition. Even if some of these survive, they obviously would not have without advanced care. This will not be available in a severe pandemic. The true CFR of this virus could become as high as 90%. To decrease the CFR significantly, we would have to assume thousands of unreported mild cases. If this is true, we will see cases in other countries very soon. We are either looking at a virus which is already pandemic-ready or at a virus with a 90% kill rate which is 2 mutations away from pandemic status. I would actually prefer the former as the latter is a potential species-wiper. 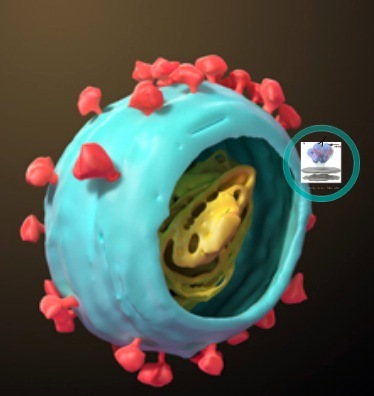 April 10, 2013, ECDC: On 31 March 2013, the Chinese health authorities announced that they identified a novel influenza A(H7N9) virus in three seriously ill patients. 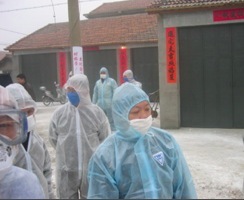 As of 9 April 2013, 26 human cases of infection with influenza A(H7N9) virus have been reported in four provinces of China: Shanghai (13), Jiangsu (8), Zhejiang (3) and Anhui (2). Of these patients, 8 people have died, 15 are severe cases and 3 are mild cases. No epidemiological link has been identified among cases. The source of these infections and the mode of transmission are yet to be determined. 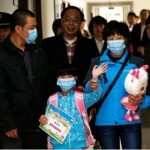 This is the first time that human infection with influenza A(H7N9) virus has been identified. No vaccine is currently available for this subtype of the influenza virus. Preliminary test results suggest that the virus is susceptible to the neuraminidase inhibitors (oseltamivir and zanamivir). Op 28 februari 2003 leidt een onderzoek naar een verhoogde uitval van leghennen bij een pluimveebedrijf in de Gelderse Vallei tot een ernstige verdenking van klassieke vogelpest. Het bleek al snel een van de grootste uitbraken van vogelpest binnen Europa te zijn. Zowel de pluimvee sector als wel de overheid werden voor een schier onmogelijke opgave gesteld deze uitbraak onder controle te krijgen. Dit evaluatie rapport verschaft inzicht in de aanpak en het verloop van de AI-crisis in Nederland.